The DevOps methodology was first adopted in 2007 with a bigger purpose of improving organizational efficiency by bridging the gap between software release and IT operations teams. This started as the core practice of continuous integration (CI) and continuous delivery (CD) with a prime focus on better quality of releases and more frequent releases. Now, DevOps is becoming the norm of the industry and over time DevOps is being embraced by multiple organizations as a digital transformation with a shared goal, involving all stakeholders, to serve the customers better with higher quality product release and more frequent releases. DevOps has evolved beyond release and deploy and now involves product owners, project managers, and all aspects of software development lifecycle. This is the key reason that DevOps has evolved as a holistic approach starting from the service team interacting with the customers till product release and production monitoring. In this blog we will explain how the 7C approach of DevOps is a natural growth and how it helps different organizations to perform better. DevOps now spans across the entire organization involving customer service, marketing, product owners, project managers, program managers, and different levels of developers, QA, release or build teams, and infrastructure team. As the main focus of DevOps is to serve the customer better and faster, so it is important that all the stakeholders have better end-to-end visibility of operations, planning, integration, testing, monitoring, delivery, and feedback. This is the 7C approach of DevOps as illustrated in Fig 1. This requires an efficient integration of processes and tools to automate the seamless information exchange and execution. The 7C holistic approach to DevOps also requires efficient collaboration between all stakeholders empowering them to contribute more. The 7C approach removes all silos of information and execution. Kovair’s Omnibus product has integrated 80+ ALM and DevOps tools. We decided to extend this Deep Integration platform for DevOps by enabling seamless integrations and execution across different tools, even home-grown proprietary tools, to provide a holistic solution starting from customer initiation to production deployment and feedback. This approach has proven significantly important for large enterprises as this enables them to have the flexibility of preserving their existing investments on tools and processes while also allowing them to selectively introduce new tools. Rather than trying everything new, this allows large enterprises to manage the changes while primarily focusing on efficiency, automation, collaboration, better quality of releases, and more frequent releases. This 7C approach gives same visibility to all stakeholders and everyone knows what feature is being released when. This approach also helps to move information / execution in both left and right direction with powerful traceability features, analytics, and dashboards. Deep integration of information and execution also reduces dependency on other teams and promotes self-service. Fig. 2 illustrates a sample DevOps flow where service team uses ServiceNow; software, product and project managers are using Jira for Agile management, developers are using Eclipse as their integrated development environment, GitHub is used for source code repository, QA team uses a test management tool for test and defect management, and finally the release team uses Chef and Jenkins to orchestrate build, release, and deployment. In real world examples, teams add more tools for code analysis, security, and production monitoring. 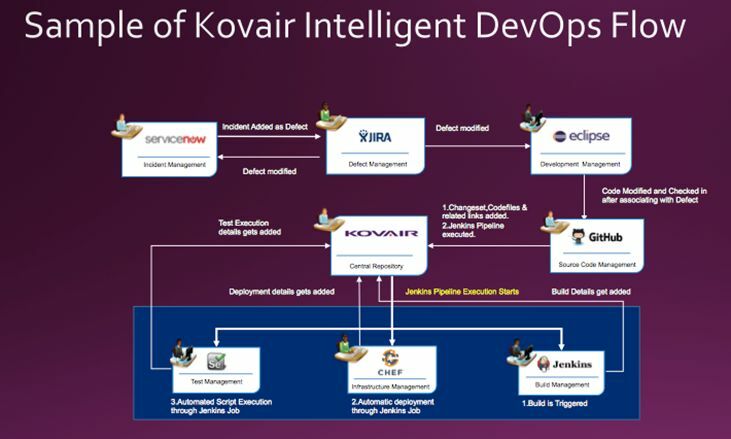 All such complex flows are supported by Kovair’s DevOps flow based on its Deep Integration Omnibus Technology and web based configurable work flow. The 7C approach is more productive as it allows faster detection, analysis, and resolution of problems. The 7C approach works well with both traditional Waterfall software management as well as Agile software management – mainly because of better end-to-end visibility, efficiency, and collaboration. 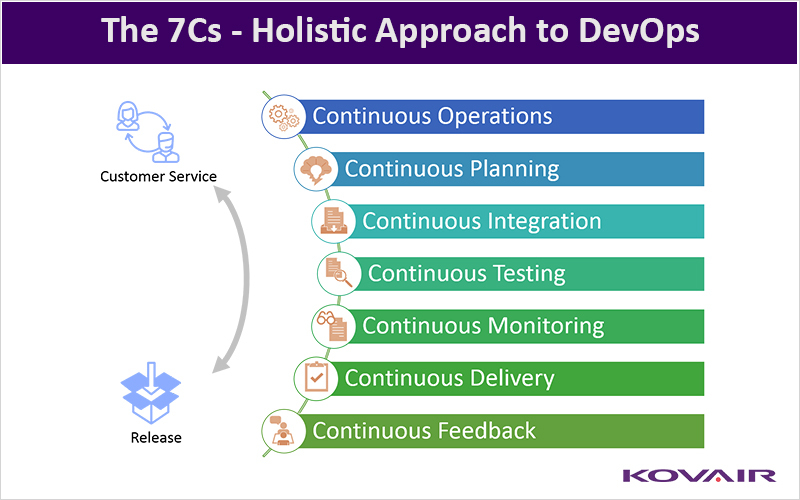 To conclude, Kovair’s 7C approach of DevOps is the natural evolution of DevOps empowering the team to achieve better efficiency and execute better. This empowers all the stakeholders in the organization by providing better end-to-end visibility and powerful means of collaboration. Involving all stakeholders also creates a better environment of trust and collaboration. 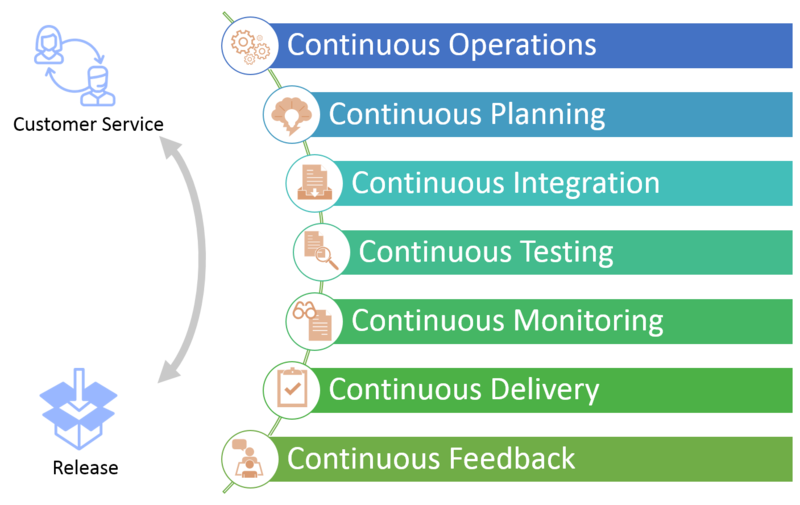 With this 7C approach DevOps is not limited to build and release but it has spanned across the entire spectrum of software development lifecycle. This is especially highly beneficial for large enterprises as it enables them to preserve their prior investments, and enhance their existing flows. This gives them leverage to selectively try new tools and technology while preserving what is working well. This is a great approach to expedite the enterprise level digital transformation. Devendra is a recent addition to the Kovair Management team in the San Francisco Bay Area. He is a software professional with over 20 years of experience in enterprise software, EDA, social media, healthcare and cloud based SaaS companies. Prior to Kovair he was leading the cloud based SaaS solution at UltraLinq Healthcare solutions. Earlier he co-founded internet startups Storistic and Oovida. He has worked with startups and large enterprises in engineering management and product and solutions management roles. He is experienced in working with customers in USA, Canada, Europe and Asia.